Does optic nerve sheath diameter on MRI decrease with clinically improved pediatric hydrocephalus? Serial change in ventricular size is recognized as an imperfect indicator of ongoing hydrocephalus in children. Potentially, other radiographic features may be useful in determining the success of hydrocephalus interventions. In this study, optic nerve sheath diameter (ONSD), optic nerve tortuosity, and optic disk bulging were assessed as indicators of hydrocephalus control in children who underwent endoscopic third ventriculostomy (ETV) or posterior fossa tumor resection. Sixteen children underwent ETV or tumor resection for treatment of hydrocephalus. T2-weighted axial magnetic resonance images of the orbit were obtained, and the ONSD was measured posterior to the optic globe, pre- and post-intervention. Evidence of optic disk bulging and optic nerve tortuosity was also assessed. Ventricular size was estimated using the frontal and occipital horn ratio (FOR). There was a significant reduction in the ONSD post-ETV (n = 9) and after tumor resection (n = 7). Average preoperative ONSD was 6.21 versus 5.71 mm postoperatively (p = 0.0017).There was also an 88 % (p = 0.011) and 60 % (p = 0.23) reduction in optic disk bulging and tortuosity, respectively. The FOR normalized in the tumor resection group but not the ETV group. After intervention, all patients showed improvement in signs and symptoms of hydrocephalus. In our study population, ONSD decreased in response to measures to reduce hydrocephalus. Optic disk bulging also appears to resolve. Serial reduction in ONSD, and optic disk bulging may be indicators of improved hydrocephalus following pediatric neurosurgical interventions. 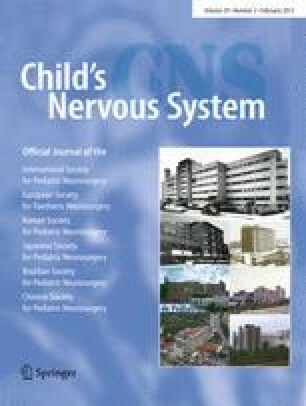 Portions of this work have been accepted for abstract presentation at the AANS/CNS Section on Pediatric Neurological Surgery Meetings in November 2011 and the Western Medical Student Research Forum in January 2012. The authors gratefully acknowledge the work of Michael Kerr, who assisted in manuscript preparation and editing. The authors would like to declare that no conflict of interest exists. Ethical approval for this study was provided by the University of British Columbia and Children's and Women's Health Centre Research Ethics Board, approval number: H11-02644. All research activities were performed in accordance with the ethical standards of good clinical practice as outlined in the 1964 Declaration of Helsinki.